Who else is going to see The Hobbit this afternoon? Wee! 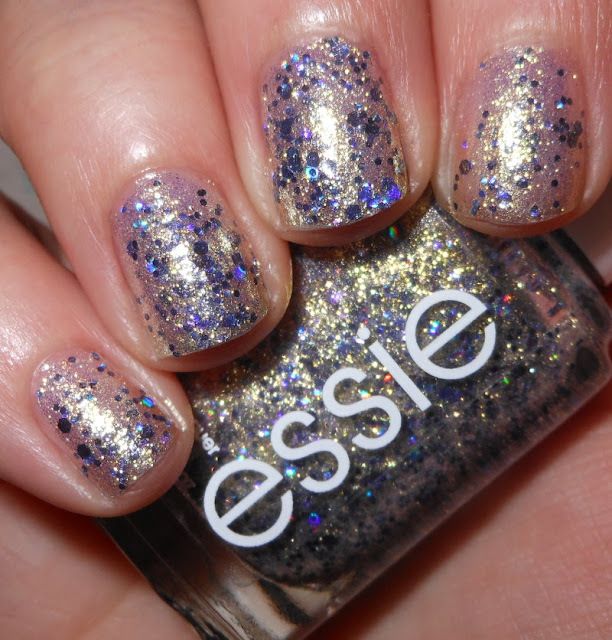 I have another one of those stunners from the Essie Encrusted Treasures collection. This is the sister/cousin/whatever relative to Hors D'oeuvres with that awesome sparkly-glitter-gasm of pure ecstasy finish I fail at describing. On A Silver Platter is a white golden silver shimmer base with blue glitters mixed in. Color: We have the exact same thing going here as we did with Hors D'oeuvres, the only difference is instead of silver glitter we have blue. Awesome. Blue and gold is my favorite color combination and that's definitely represented here. Formula: Good formula. Like I mentioned with the last one like this, I recommend only wearing 2-3 coats of this on its own. The sparkle is so reflective you won't see your nail underneath. 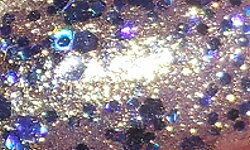 The 2-3 coats will limit the base from overpowering the glitter which will happen if add more coats. Price: I paid $8.50 for this at Target. Overall: Beautiful! This is another stunner and must have in my book. Even though Hors D'oeuvres is similar, I think they're both beautiful in their own right. I got to see the midnight premiere of the movie. It was pretty awesome! I really want to get this one. It's always sold out!! This is really pretty! I love glitter polishes but I don't wear them very often because they're such a pain to remove. And we're probably going to see the movie this weekend; can't wait! I love it! just ordered this polish a few days ago, can't wait to try it!